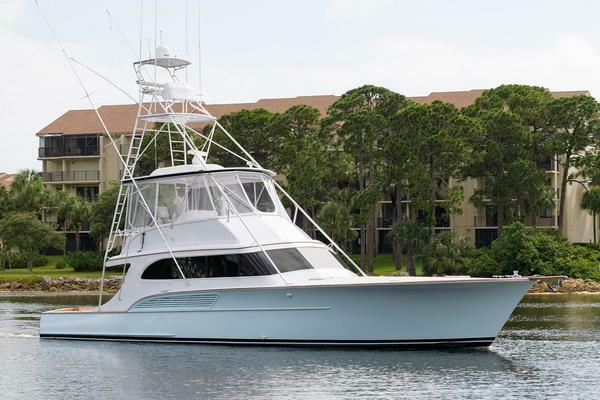 (LOCATION: Hernando Beach FL) The Hatteras 46 Convertible is a classic sports fisherman with high foredeck, sweeping sheer line, and low freeboard cockpit. She comes with a spacious flybridge with custom hard top, huge cockpit, teak finished salon, full galley, three staterooms and two heads. There’s room for everyone and everything whether you are fishing or cruising. The flybridge features a custom hardtop. The centerline helm has two helm seats with a 360º view. There is guest seating forward and ample storage to keep necessities at hand. A ladder leads below to the large square foot cockpit features a prep station, fighting chair, tackle locker, outriggers, flush mount rod holders, cockpit bolsters, in-deck livewell & fish box, spacious lazarette, and transom door. The teak salon is spacious with room for relaxing or entertaining. It features large windows, L-shaped sofa, and entertainment center. The galley is open with teak cabinets, microwave oven, three-burner electric stove, stainless steel sink, and refrigerator & freezer. There are two guest staterooms with upper and lower bunks, under-berth storage, hanging lockers. The dual-entry guest head compartment has vanity and shower. The master stateroom is forward with two opposing berths with under berth storage, hanging locker, and en suite head with vanity and shower. This Hatteras 46 Convertible has newly rebuilt twin Detroit Diesel engines ready to provide years of dependable performance. The engines where rebuilt at a cost of $ 25,000 each! Basically no hours since rebuilt in 2015. Broker will give details. There is a Onan 15-kW generator for offshore electrical power, four reverse cycle HVAC units for interior comfort. Good looking and comfortable; She is available now. Call for more information and to schedule a showing. Currently having complete blister repair work done professionally. Documentation of work will be available upon request. 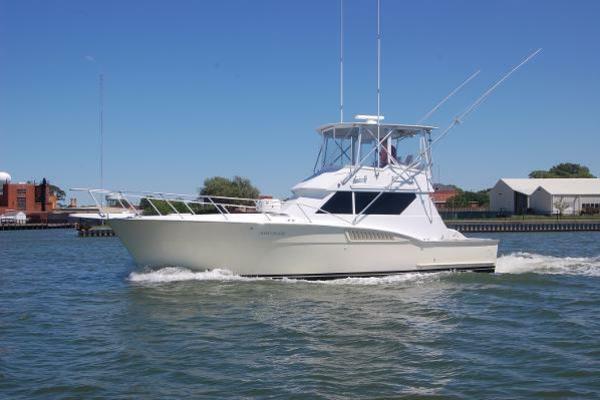 West Florida Yachts would love to guide you through a personal showing of this 46' Hatteras 46 Sportfisherman 1983. This yacht for sale is located in Hernando Beach, Florida and priced at $65,000. For a showing please contact us by filling out the form on this page and we will get back to you shortly!